Seasonal consignment sales are the probably the epitome of frugality, where one must carefully weigh worth between money and time, savings and effort, value and intangibles. It has not escaped me that to place items for sale in a seasonal consignment sale, one must devote time and energy to find which items for the season that have not been worn in six months no longer fit and then look for spots and tears and whatever else that will cause the clothes to be rejected. Clothes must be laundered and ironed to look their best, then hung on hangers just so with the tag in the upper right corner. Some sales require all to be hung on wire hangers only because the plastic ones can break. For some, shoes must be in bags pinned on hangers and others just want the pair fastened together to be placed in bins. Other items like nursery decor, toys, games, shoes, DVDs, CDs, homeschool materials and books must all be clean and in working order with batteries included for those items that need them. Depending on how much you have to do, it can take a least a few hours of preparation and some consignment sales have limits of how many items can be listed, that is listed under one consignor's number and each one has a fee. The Princess tried on all her clothes from last year, because some things were large on her then and she seems to be in a slow, but steady growth, staying a bit petite for her age and we cannot go by the size on the label to determine what will fit and not fit. She thinks this is such a waste of time, but this is the worst of her part in the preparations and just the beginning of mine. After I have sorted the piles of what she will still be able to wear and not, I have much to do. After I have prepared the items, I must take them to the designated place at the designated time to drop them off. Now for most sales, the only thing I must do afterward is to pick up the leftovers, if I want them back, at another designated time on a Saturday. Some sales also have the check ready and others mail it in a day or so. As a seller, I get to go the preview sale for sellers and volunteers, which is usually on Wednesday night. To entice people to volunteer to help with the sale, there are earlier preview times according to how many shifts one worked. A shift is three hours, so for working three hours, one gets in a half hour earlier up to three shifts. I don't think the trade off is worth it personally. Particularly when the children of volunteers are put in a daycare with other children where it is likely that at least one child has a contagious illness just waiting to be pass along, which happened the one and only time I volunteered when the Princess was four. They also tried to feed her junk food, which she refused, but this was after I told them she had her own food and not to give her anything else. Now the Princess is old enough to help or sit quietly doing her lessons, but I still don't see the trade-off for volunteering three hours as worth it. Unfortunately, the second of the two sales for which I registered, which is this week, has a rule that new sellers MUST volunteer one shift. So, tomorrow I drop off my items and begin working for three hours right through our lunch time. They usually allow the workers time to eat, but I am still not looking forward to it, because when I work, I work hard...perhaps harder than I need to do? The last time I was at this, I noticed that I matched the work of three other volunteers collectively, who spent a great deal of time talking. I also worked through the hour lunch everyone else took so that I was only there two hours instead of three. I see time as precious, something you cannot buy or make up when wasted, and as a homeschooling parent, I have other things to do that are far more important to do than to organize assortments of clothes, shoes, games, toys, etc. However, if I do it this one time, I will not be a "new seller" next time and hopefully will not be required to do it again...ever. Today I must take off the tags of my leftovers from the last sale and put on new tags for the next one. Tomorrow makes for a short homeschool day and it is the same for Wednesday with Thursday being our errand day. Obviously we are not going to cover all the lessons I would like but I do have a few shortcuts for weeks like this so that the most important subjects are still covered. Basically, it is just different style with resources I would typically use as supplements. I wish I had sold more in the first sale so I would not have to go to the second one. I sold about 33% of what I listed for a check of $101. 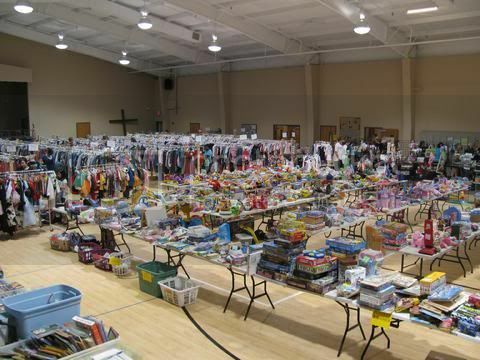 Which was pretty good as this sale had so much in clothes left over and I sold more in homeschool things than clothes. Still, this is twice more than I did in the last two fall sales put together! The next sale is also early in the season and very popular so I would like to double my profit with the 66% of items I have left and this time I marked many of the items for the 50% discount on Saturday, hoping I will have very left over. Now, my one peeve is about the seller's fee. Most sales charge $6 to $7 for a seller's fee in addition to the 30% they make off the sale, which in the last one was around $51. The first $10 of the sale just goes to make up for the seller's fee which is about four tops the way I price them. I do not understand why there is a seller's fee at all, but I particularly don't get the seller's fee when a person is also volunteering her time. The first sale takes off the seller's fee for volunteering, which I think is still not a good trade for my time: for three hours I save $6 and I get a 30-minute earlier shopping time? However, the sale I am in next not only requires new sellers to volunteer three hours but also charges $7 for the seller's fee whether you volunteer time or not. And...is it really volunteering when it is required? I think not! With all that said, I guess it is worth it because when I do well with the consignment sale, it offsets the amount I spend in the consignment sales for new-to-her clothes and shoes most times. Oh, and can you believe it? I bought her another fancy dress after I already said she does not need another one, but it is rather lovely.